We spent the week on the boat, at the dock, in mostly wet and windy weather, and I knew I would rather bake than do anything useful. 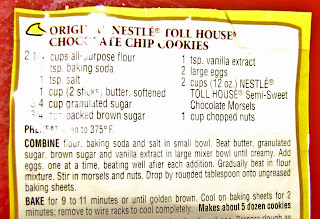 I just couldn’t decide what kind of cookie to make using only the ingredients on board. Decisions, decisions, decisions! The weather made baking a very attractive indoor project, but not attractive enough to walk to the store for supplies. Now how lazy is that? 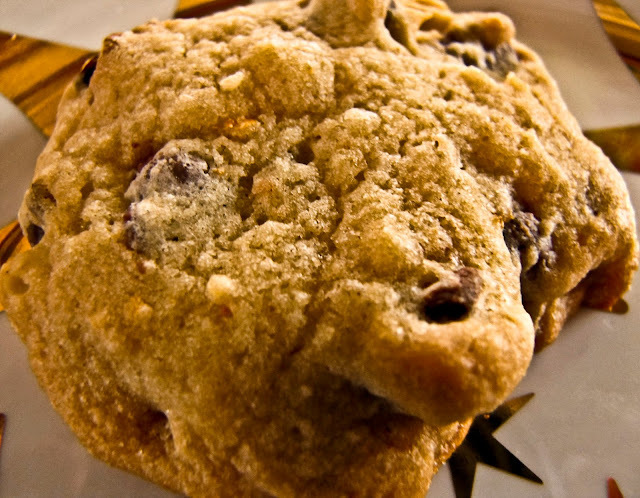 Eventually chocolate chip cookies won out over biscotti as an easy choice. One fat naval orange almost begged to be part of the action. 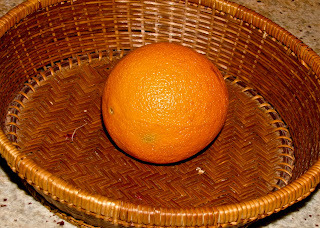 It looked so lonely sitting in the fruit basket, days after it’s friends had disappeared one by one. 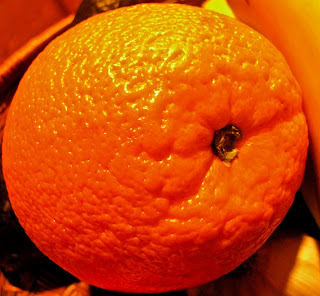 Orange zest, hmmm - citrus might be a welcome contrast to the double-sweet dose of chocolate and brown sugar. I decided to add the zest of that large orange to a half-recipe of cookies, using the recipe on the back of the package of chips. The batch of chocolate chip cookies was a perfect test subject. Note the past tense, “was”. 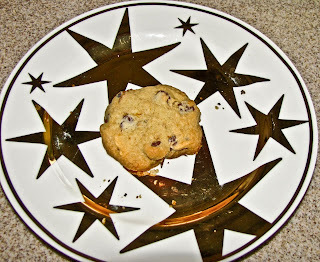 We taste tested the cookies while they were still warm from the oven - ummm, good. We nibbled on a few more after they cooled - ummm, still good, and the tangy hint of orange really came through. Friends came by and soon the pile of cookies had shrunk by half. These treats were going fast, and I worried that we would be wearing the evidence for weeks. The crew at the nearby Water Taxi office enjoyed a dozen and soon this was all that remained to be photographed. Note: This post is just a poorly-disguised excuse to play with the Macro and SuperMacro settings of my new camera - features I'm still getting used to. (Turn this dial to P for Program - press that icon two or three times on another button - and don’t expect the zoom to work on SuperMacro, just move the camera body - now remember all of these steps tomorrow…) Hey, I was excited to work with regular Macro, but SuperMacro is a whole new world of fun. Dozens of shots are waiting to be analyzed, discarded or Photoshopped... but I think I'll just keep playing with the camera instead. In 2001 I found directions for creating a sourdough starter from potato water and local, wild yeast. We were cruising in Alaska at the time, so I like to think my starter shared a history with the early sourdough prospectors. Sadly, after a few years, I had neglected it for too long and it developed a noxious smell as well as some interesting molds in pastel shades of green and pink. King Arthur Flour Co. supplied a replacement starter, which has been working happily for years in breads, rolls, muffins, pancakes and waffles. Well, happily until 2010. My sourdough pot now sits, ignored, hidden way back on the lower shelf of the refrigerator, a victim of my faltering 2010 resolution to eat less and eat healthy. I feed the starter weekly and apologize for my neglect, but I just know it feels rejected. This weekend I succumbed to temptation, but only a little. Produce from a recent grocery trip prompted wicked thoughts of eggs Benedict with asparagus, sort of a celebratory nod to an entire week of Seattle sunshine. Omigod, hollandaise sauce is such a decadent treat, it’s like tasting the flavors of Spring while basking in sunlight. Why does it have to be such an unhealthy fat calorie hit? I moved on. The fresh asparagus went into a healthy pasta primavera dish for dinner, but the English muffin idea lingered on. Don't you just love the idea of a yeast bread that cooks in a skillet instead of baking in the oven? It's always a winner onboard, so why not at home? The blog-recommended technique of oven baking following skillet browning is a winner; English muffins CAN then be enjoyed immediately, without toasting. Not a big thing, because we prefer toasted muffins, though this method helps to reduce the threat of overtoasting. I don't know about you, but in our kitchen or galley, overtoasted is the same as burnt, and one of us has definite opinions about that! Oh, yeah. I fed the starter late Saturday morning, mixed and kneaded the dough that afternoon, let it rise and then held it in the fridge overnight. Early on Sunday morning -even before making the coffee- I let the dough came back to room temperature, rolled and shaped the muffins and let them get light and puffy. Waiting and watching dough rise is not a spectator event, so it was a good time to sip coffee and read the paper. The cooking/baking went quickly and filled the kitchen with the heavenly, comforting aroma of fresh bread. Oh yum, we could hardly wait for them to cool to try our fork-splitting techniques and enjoy. 1. Dissolve the dry yeast in a bit of water until it begins to bloom. Place starter in a glass or ceramic bowl and stir in the bloomed yeast, sugar, salt and cooking oil. Add flour, a little at a time, until the dough comes together into a ball. Knead by hand on a lightly floured surface for 10 minutes, or with the dough hook of a stand mixer for 8 minutes at a slow setting. 2. Place the kneaded dough ball in a lightly oiled bowl, cover lightly with oiled plastic wrap or a clean tea towel until it doubles in bulk. Time will vary according to kitchen temperature (this batch took about 2 hours). Put the bowl in the fridge overnight to bump up the flavor, it seems to increase the sour tang. 3. Bring the dough back to room temperature (about an hour) and turn it out gently on a silicon baking mat generously sprinkled with cornmeal. Roll out lightly to about ¾ inch thick - not too thin or they won’t get puffy. Cut the dough into 3 to 4 inch rounds (a biscuit cutter or an empty tuna can works just fine); move them apart and sprinkle the tops with more cornmeal. Cover them loosely again and let them rest at room temperature until puffy, but not too puffy. Use a thin spatula to carefully move each muffin from silicone pad to the skillet without deflating them - watch out, they really want to stick to your fingers if you try to help them off the spatula! Keep the muffins well-spaced in the pan; it makes for easier turning and prevents them from sticking together. Cook for 5 to 7 minutes on the first side, just until the bottom is lightly browned. The muffins will puff a bit more so turn them gently to avoid deflating, and cook 5 to 7 minutes on the other side until lightly browned. Avoid overbrowning since they will be toasted in a toaster before eating. 5. Transfer the cooked muffins to a nonstick baking sheet; place in the preheated oven and bake at 350F for about 6 minutes. Cool on a rack. 6. When you are ready to enjoy a muffin, insert the tines of a fork all around the rim edge and then gently pull the two halves apart. This gives you a bumpy surface that will toast crisply and offer ample nooks for butter to soak in. The muffins freeze well, but they don’t last very long around here so it’s not an issue. I am in love, again - with the shiny new KitchenAid stand mixer that now resides in my kitchen. It has already stirred biscotti and Spritz cookies, kneaded pizza dough and French baguettes, and been a counter adornment. It's time to task it and me with something new, completely new, something more challenging. Something like... homemade sausage, that's a new arena. I am not really a big fan of sausage, or hot dogs, links, meatloaf, or anything else that relies on a mixture of smooshed up mystery ingredients and fat. Besides, sausage makes me burp and the taste plays reruns for ages. That said, one of my 2010 resolutions is to master the art of sausage making. My logic is that if I can control what's in the blend, I can improve on the taste and diminish the aftereffects. Now my KitchenAid has company, thanks to easy ordering from Amazon.com. A yet-unused meat grinder attachment, a sausage stuffer device, Bruce Aidell's Complete Sausage Book and Michael Ruhlman's Charcuterie now join the crowd of must-have gadgets and cookbooks in my kitchen. Further research is needed to track down a local source for sausage casings, but I'm working on it. And I am still reading the books and finding sausage making hints, recipes and blogs online. Lately we have been taste-testing the ingredients for Merguez sausage, using preground lamb and Italian sausage links, with a combination of interesting spices and fresh produce. I have not strayed too far from a blend of two Aidell recipes, though the resulting Merguez patties and mini meatloaves are so tasty we might never make it to the sausage stuffing stage. Adapted from Bruce Aidells’ Complete Sausage Book and Michael Ruhlman’s Charcuterie. Preheat the oven to 375. Use kitchen spray to oil a pan of muffin-sized Bundt cups - you know, the ones with the cone in the middle to make a hole. No Bundt muffin pan? Substitute custard cups, large muffin tins or small ramekins - they all work. Place the onions in a microwavable bowl, cover with water and cook just to soften. Drain, rinse with cold water to cool, and then drain again. Remove the casings from the sausage (if using links) and add all ingredients to a large mixing bowl. Use your hands to blend thoroughly; don’t smoosh it heavily, just mix and mix and mix. Fry a small, flat patty until done (no pink remaining) and taste for salt, pepper and other seasonings. Adjust as needed. Scoop out a ½ cup or so of the mix and plop it into a prepared Bundt cup, packing lightly and leveling the top. The mix should yield six mini meatloaves, depending upon the containers and how full they are filled. Bake until you measure an internal temperature of 160 degrees, roughly 25 minutes. If the tops look too moist, briefly broil to add a crisp crust. Remove to a heated serving plate, and serve with a side of tzatziki - cucumber and yogurt sauce. Place cucumber chunks in a strainer; add salt and toss gently. Place strainer over a bowl and let sit awhile you work on the meatloaves. You will be amazed at the quantity of liquid that drains out! Rinse the cucumbers thoroughly under cold water; drain again and wring in a clean tea towel to remove as much moisture as possible without reducing the cukes to moosh. Place all ingredients in a bowl and mix thoroughly. The flavors will blend and intensify as they sit. The sauce will keep overnight in a covered container in the refrigerator, but will need to be used within a day or two. We love these formed as mini loaves or as patties served with Tzatziki sauce and accompanied by sides of a Greek-style panzanella salad and lemon-roasted potatoes or lemony potato salad. A dessert of wine-poached pears with honey-flavored Greek yogurt finished the latest Merguez meal, but we ate them before I could grab a photo.